Hope you're all doing well? It's back to work for me tomorrow, but I'm actually feeling very positive. One of my New Year's Resolutions was to broaden my blog content and create more posts that I hope will be useful to my readers. I also want to add in the occasional personal post, just to let you know I'm not just a beauty obsessed robot ha! I'm also still snap vlogging and would love you to stop by and check them out! SC: JewelBeautyBlog. Your feedback is SO important to me and I would love to know if this kind of post is something you would like to see more of in the future? I would also love other suggestions and it would be amazing if you could leave them below for me! 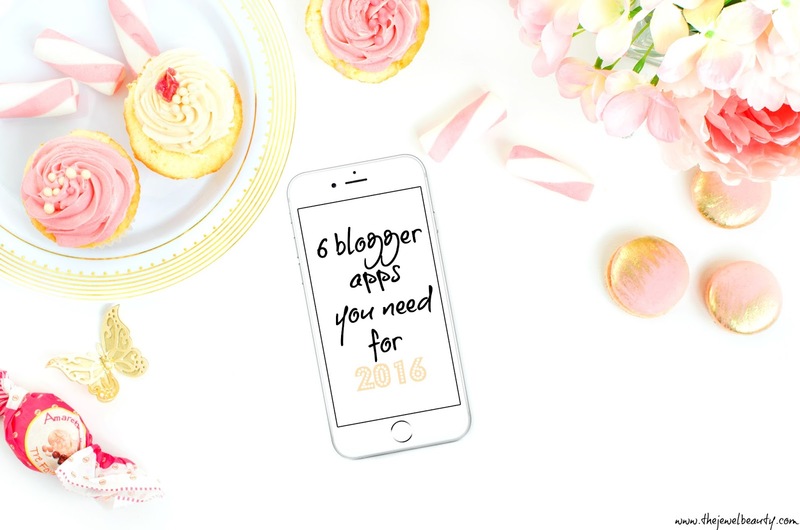 So before I begin to ramble, lets get into 6 apps that I think every blogger would benefit from in 2016. Buffer is a fantastic and extremely user friendly way to share your content across your social media accounts on both your mobile and desktop. The best feature for me is that Buffer allows you to create a custom schedule that enables you to post your messages at the very best times for your personal feed! I've found this so valuable since becoming so busy at work, as I can write and plan my posts and ensure that my Social Media is there to support my blog activity. I've also used Sprout Social & Hootsuite at work, which are both great, but quite a bit more complex. Developed by the fantastic Dana Fox from The Wonder Forest, BlogGo is refined, no-fuss and super easy to use! I don't blog from an app, but it's definitely worth having an editing app just in case you need to tweak your post, notice any errors or simply just want to put your ideas straight into your blog. I've never really got along with the official blogger app and BlogGo allows you to do pretty much everything you would need to do on the go! If you blog via wordpress, I believe that their official app is quite good editing from your mobile! I can't quite remember how I managed to find Retrica, but oh my god I'm so glad I did. If you're a shameless filter lover like myself then Retrica is for you! The thing I love is most filter apps are quite samey and I'm never 100% happy with the colour cast. I do like to try and keep my background White if I can, which is generally a compromise when it comes to filters. However, I'm pretty sure Rertica has a filter for everyone! I use Retrica loads for my Instagram and I also like to snap pictures and upload them to my Twitter feed, If I'm feeling a bit more fancy! I'm a complete newbie to Snapchat, but I love the freedom it has given me to share a more personal side to my readers. I often post behind the scenes images and I have even started snap vlogging a few weeks ago, which I'm hoping will lead me to have the courage to start properly vlogging. If you're feeling a bit stuck in a rut - Snapchat will give you a new lease of creativity and a fun new way to share content with your readers! I've also used Periscope at work, which is great for live streaming. I had to include one for the soul! I'm actually working on a project called #BloggerWellbeing as I feel that the Blogosphere has become a bit of a beast lately and it's something I'm hoping to have live by March 2016! Don't get me wrong blogging is a hugely rewarding experience, but It's become such a digital phenomenon. It's safe to say that blogging now comes with a multitude of pressures and that's where a little self-help can go a long way in keeping you motivated. Headspace is a fantastic app that will help you practise mindfulness that will help with stress management. With over a million users you can map your journey, track your progress and learn how to maintain your overall peace of mind and well being. This is NOT a sponsored post - All Apps have been tried and tested and recommended honestly by myself. I'll definitely have to check these out, I love buffer too and I don't know how I'd cope without it! i don't have any blogging apps on my phone. maybe i should try some of these to make blogging on the go easier. All these sound great and I might need to download Buffer as I've put scheduling more on my 2016 blog goals so this will be handy thanks! this post is so helpful, thankyou!! Heading onto the appstore right now- this is such a useful post! I love playing around with filters so will definitely check out Retrica. I recently downloaded a mindfulness app and its amazing how calming even a few minutes of breathing and zoning out can be. This was a really helpful post, I hadn't heard of Refrica or BlogGo but they sound so handy! This is a great post. I have buffer but I've never used it, I tend to use hootsuite. I love filters aswell so I will have to try Retrica. Great options, I didn't know a few of them so I'm definitely excited to try them out. Thanks! What a great post & you have a beautiful blog as well!I just stumbled onto your blog so I thought I would leave a comment! I used buffer as well! It's such a lifesaver to schedule my tweets! I will have to check out google keep and headspace! It sounds right up my alley! Thanks for sharing!